Taking cues from Cabo San Lucas’ juxtaposed landscape of beautiful long beaches and desert foliage, the 47 club-level guest rooms and suites of The Towers at Pacifica mirror the existing resort’s elegant and minimalist décor with warm organic elements that combine modernity and high-design with the familiar comfort of feeling at home. Six suites feature private plunge pools, and the majestic top-floor Presidential Suite boasts the finest ocean views in the entire resort. 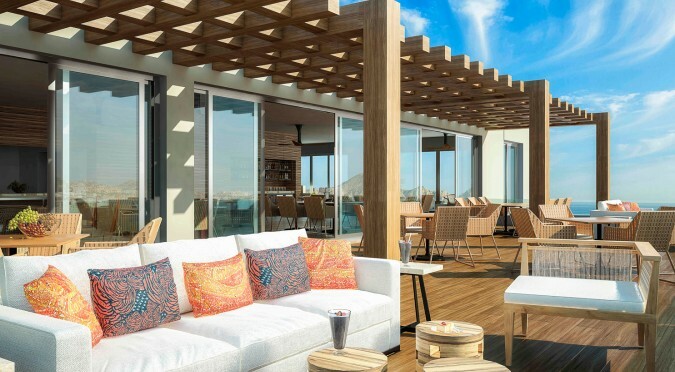 An array of luxe amenities, including 24-hour British Butler Institute-certified service, will also be a part of The Towers at Pacifica experience. A third multi-level building of the expansion will include a new gourmet restaurant featuring traditional Baja cuisine that emphasizes native ingredients of the region, as well as a sophisticated bar and outdoor beach lounge on the ground floor; a state-of-the-art oceanfront fitness center on the second floor; and the VIP Towers Lounge on the third floor, available exclusively to guests of The Towers at Pacifica and accessible via sky bridge, all with dramatic ocean views. Towers Lounge guests will enjoy a variety of elevated culinary experiences rotating daily, as well as handcrafted cocktails to sip on at leisure. Hook & Cook is one of two beachfront culinary experiences with Chef Investigativo (aka Investigative Chef) Luis Gonzalez. Guests fish on the shore alongside Chef and use their fresh catch to create his signature mesa de ceviches. The ceviche bar includes an array of seafood with house-made add-ons such as smoked salsas, beet’s ink, infused oils, and emulsions. Beachfront Clam Roast is Chef Luis’ other beachside creation in which Chef roasts clams underneath the sandy turf using dry bushes, wood, iron, and stone. The clams are then dressed with a variety of vegetables, cold meats and fresh cheese, including handpicked rare local roots and cacti that are native to Baja. San Miguel Blown Glass Factory Excursion is a butler-guided trip to the village of El Arenal in which guests create their own custom blown-glass piece. Inspired by the glass hearts on display throughout Pacifica – made with 100% recycled glass donated by the resort – this adventure supports the local artisans and ends with a tangible memory of Cabo. Additionally, The Towers at Pacifica butlers – who view themselves as true “artists of service” – can create customized experiences for guests to turn their imaginations into a reality. From arranging a cliff-side proposal overlooking the Pacific Ocean at the award-winning Quivira Golf Club, to leading guests to Cabo’s best street food, local shops, and more while carrying their bags for them, to coordinating a spectacular whale-watching trip during the winter months, Pacifica butlers are committed to helping guests make lasting memories. The Towers at Pacifica will begin welcoming guests December 22, 2016. Advance reservations are now being accepted and can be made by visiting www.pueblobonito.com/the-towers-at-pacifica. Introductory rates start at $1500 per night, based on double occupancy.